You want to track changes to primary key values using begin and end datetime values. You can create a job that uses a Key Effective Date transformation. In the Transformations tree, in the Data folder, drag the Key Effective Date transformation into the empty job on the Diagram tab. Select and drag the source table into the source table location in the Diagram tab. In this sample job, the source table contains customer information. Drag the cursor from the source table to the input port of the Key Effective Date transformation. This action connects the source to the transformation. Select and drag the target table into the target table location in the Diagram tab. The target contains the same columns as the source. Drag the cursor from an output port of the Key Effective Date transformation to the target table. This action connects the transformation to the target. The following example shows the sample process flow. 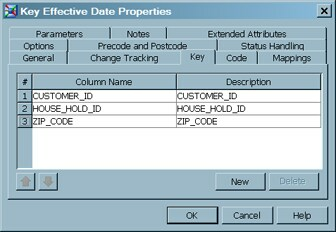 Open the properties window of the Key Effective Date transformation, and then select the Change Tracking tab. Under Column Name, triple-click to open the pull-down list to select the source and target columns that contain the begin and end datetime values. Under Expression, enter the expression or value that is applied when begin and end datetime values are missing from a source row. Open the Key tab and click New. Under Column, select the name of the first column in the primary key of the source table. Similarly, select in order any other columns in the primary key. The following display depicts the completed Key tab for the sample job. Right-click in the job and select Run. SAS Data Integration Studio generates code for the job and submits the code to the SAS Application Server for execution. After the completion of the job, right-click the target and select Open. The following display shows the target table data for the sample job.